Written by Peter Conrad The National Institute of Tourism (ICT) of Costa Rica promoted a great campaign with some other Companies and Agencies of Tourism as Travel Excellence. This initiative was to gift a trip to Costa Rica and the Harmony Hotel was the last stop as a perfect way to finish this journey. Located in Playa Nosara you can take a 35 minutes flight from San Jose to Nosara. There you can rent a car or take a taxi to the town. Also you can drive about 6 hours from San Jose. Harmony Hotel is nestling among the abundant green nature a short walk from the beach it is like a calm temple. No construction is allowed on the beached in this area, this is a sustainable hotel perfect for people whom enjoy the natural rhythm. It provides an immaculate beach experience with miles of serene sand to walk; for those who love surfing, this place is heaven, but it´s still quiet enough. The hotel itself has sporty – relax sense. Rooms are lovely surrounded in nature and beach life, the pool is great, and the food is delicious there is a private patio with an outdoor shower! It has wonderful things to talk about like its beautiful beaches, amazing sights and friendly people. However, only after experiencing a holiday there, you may realize why people keep returning – year after year. One thing is for sure, it’s impossible to leave this place without turtle hatching in Playa Ostional Wildlife Refuge. Vultures circled and lurked (as vultures are wont to do), but to not avail. The humans rallied to the tiny turtles’ defense as they made their way to the sea. Some too weak or tired died along the way and volunteers buried them in the sand. It is hard to describe the feeling how sweet, how moving, how humbling, how miraculous it is to see nature at its complicated best. It is something you would never forget. The turtles are considered delicacies and were once fished almost to extinction about 25 years ago when they became protected by the Costa Rican government. After these measures were taken, their numbers did rise sharply, although it seems they’ve recently plateau—probably due to the changing acidity of the seawaters. If you are interested in shopping there are lovely, wonderful local handmade items in every shop in the minutes-away village. 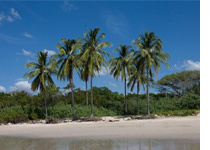 Nosara area is known for its amazing surfing and charming little towns and shops. If you decide to visit The Harmony Hotel be prepared for an unforgettable adventure where you will do horseback riding at sunset on the beach and through a nature reserve, where you would practice yoga and pilates, and have an amazing experience.